Located in the heart of a former gold rush boomtown, the Old Town Guest House (719-632-9194, www.oldtown-guesthouse.com) stands on the site of the Old Colorado City City Hall. Over the years many other buildings have occupied the land — including a mattress factory — and in 1997 Kaye and David Kaster welcomed their first guests to the newly constructed B&B. 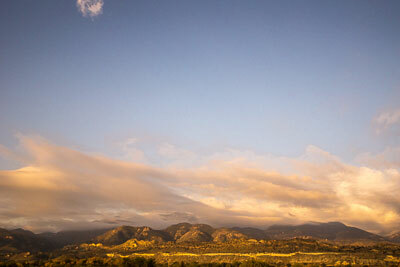 In 2005 Shirley and Don Wick purchased the Old Town Guest House, and today they continue the long tradition of top-drawer hospitality at this luxurious Colorado Springs property. 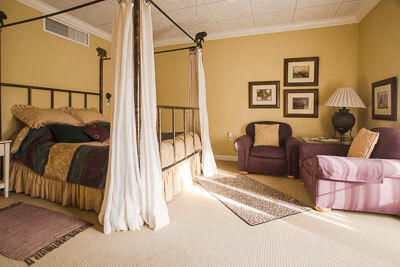 Access is excellent at the Old Town Guest House, as former physical therapist Kaye Caster hired an access consultant to advise her, before construction ever began. Accessible parking is located near the entrance, with ramped access up to the front door of the three-story brick building. There is barrier-free access to the first-floor parlor and dining room, and elevator access to the upper floors. The accessible African Orchid Room is located on the third floor, and it boasts wide doorways and excellent pathway access. The room is furnished with a 23-inch high queen-sized waterbed, draped with mosquito netting. There is also a gas fireplace and two chairs in the sitting area, as well as a writing desk with a chair, and a refrigerator. African accent pieces dot the room to round out the jungle decor. There’s just a small quarter-inch lip out to the balcony, where you’ll find a hot tub and an absolutely beautiful view. Although you have to be able to walk a few steps to use the hot tub, everyone can enjoy the view. 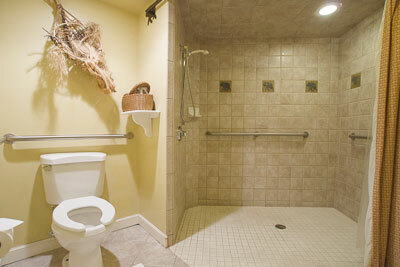 The bathroom has a large roll-in shower with a hand-held showerhead and grab bars. A portable shower chair is available upon request. Other access features include toilet grab bars on the right and back walls (as seated), and a double sink and counter area with roll-under access. After a good nights sleep, you’ll enjoy a yummy breakfast prepared by Don. Guests are also invited to join Don and Shirley for afternoon wine and hors d’oeuvres in the parlor. It’s the perfect way to kick off your visit. The property is also within walking distance of many attractions of Old Colorado City, including a number of shops, galleries and restaurants. There is good access throughout the area — especially on Colorado Boulevard, the main drag — with wide level sidewalks and curb-cuts at every corner. Many of the storefronts have level access, although there are a few with a step at the doorway. Save some time for a visit to the Old Colorado City History Center (719-636-1225, www.occhs.org), located on 24th Street, across from Bancroft Park. There’s ramp access up to the entrance, and good access to the first-floor exhibits. Inside you’ll find a variety of old photos, games, clothing and furniture from the late 1800s and early 1900s. It’s housed in the former First Baptist Church of Colorado City and it really offers a good overview of the history of the city, and of the Pikes Peak area.